This pairing of a PXW-FS7M2 4K XDCAM Super 35 Camcorder Kit with an 18-110mm Zoom Lens from Sony provides you with a camera and lens system ready for today&apos;s Super 35mm 4K single-camera productions. Well suited to cinema, documentaries, news magazines, or as the base of a kit to build upon for commercial production. A sturdy locking E-mount, which can support cinema-style zoom lenses, and an electronic variable ND filter highlight some of the camera&apos;s features. The camera supports recording of HD, UHD 4K, and DCI 4K to integrated XQD media card slots. 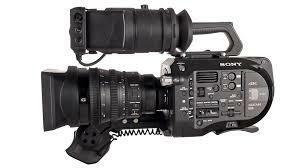 Expanding on the original FS7, Sony&apos;s PXW-FS7M2 XDCAM Super 35 Camera System is a flexible 4K camera system. Designed as a camera that is at home on productions as diverse as "Cinéma Vérité"-style documentaries, reality TV, commercial, and corporate applications It features a Super 35mm sized sensor that allows you to capture images with cinematic depth of field. The camera incorporates a stronger locking E-mount that is fully compatible with E-Mount lenses, and supports all electronic connections. The locking mount reduces lens play, and allows you to use most 35mm lenses including PL, EF, Leica, and Nikon via optional adapters. This stronger E-mount is ideal for using heavier-long cine-zooms without the need for additional lens support. The camera records in your choice of XAVC-I, XAVC-L, or MPEG-2. However, MPEG-2 recording does not support the high data rates the camera is capable of generating when shooting in UHD, and is limited to recording HD video only. The camera incorporates Dual XQD media card slots that support simultaneous or relay recording. An ergonomically designed handgrip provides control of many of the camera&apos;s functions and features an adjustable length support arm. The Camera supports two signal processing modes; Cine-EI and Custom. Cine-EI offers three color grading spaces for electronic cinematography production. The Custom mode supports Rec-709 and Rec BT-2020 at UHD 3840 x 2160 with Y, Cb, Cr color subsampling. You can set the PXW-FS7M2 to record onboard and monitor on a BT 2020 compliant monitors via HDMI 10-bit 4:2:2 or SDI at 10-bit 4:2:2 with a 709 monitor LUT applied. The PXW-FS7M2 is equipped with a locking E-Mount that provides improved stability and strength compared to a standard E-Mount. It features a safety interlock system that helps prevent accidental disengagement of your lens from the camera body. The locking mount also reduces lens play compared to a standard E-Mount and the locking mount is strong enough to support long cine and ENG zooms that normally require a lens support. The camera body is made from magnesium, which is lighter and stronger than aluminum. This allows the camera body to weigh only four pounds. It also incorporates a shoulder pad and is designed to sit on the operator&apos;s shoulder by extending the support arm of the SmartGrip, which allows the camera to be held in front of the operator without requiring a support rig. With the PXW-FS7M2 the viewfinder and mic holder mount has been repositioned. The viewfinder and mic holder now attach to a replaceable 15mm rod. This allows you to swap out the included rod with a longer rod (not included), allowing you to move the position of the viewfinder or mic holder relative to the camera. You can adjust the position of the viewfinder so a left-eye shooter can use their left eye, while the camera is resting on their right shoulder. The PXW-FS7M2 records internally in both DCI 4K and UHD 4K at up to 59.94 fps, and in HD up to 180 fps using XAVC-I or up to 120 fps with XAVC-L. DCI 4K (4096 x 2160) can be recorded internally without the need of an external recorder. The camera features two XQD media slots that support simultaneous or relay recording. The XQD card slots are shallower on the PXW-FS7M2 compared to the FS7, making inserting and removing media cards easier.